PJ and I were in New York City for a few days over spring break. I saw five plays over the four days we were there. 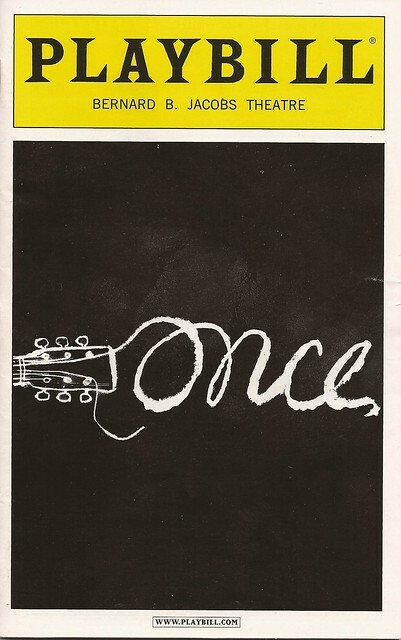 The first show we saw was Once, the musical adaptation of the great 2006 independent film. I loved the movie, so I was both eager to see the musical and a little anxious about it. I had tried to see it before but could only get seats with a partially obstructed view. This time we could get tickets without obstruction, but our seats were on opposite sides of the orchestra, which seemed fine to us. The challenge this musical faced was that the movie’s plot is rather thin: guy meets girl; she inspires him to make music; they fall in love, raising the question of whether they’ll get together or not. Other than sing together, there’s not really much more to the plot than that. To fill it out into a two-act structure, the musical adds a few supporting roles and a couple of musical interludes. Steve Kazee won the Tony for Best Actor in a Musical for his performance as guy, but we got his understudy, Ben Hope instead. We had really wanted to see Kazee, but Hope was excellent in the role. (He also has great deltoids! Indeed, the whole cast is great. I was especially glad to see David Patrick Kelly, who starred in the Broadway production of Twelfth Night that I love to show students when I teach the play. He plays Guy’s father. Cristin Milioti plays Girl; she’s wonderful too. Overall, it’s a great show, and I see why it won Best Musical: it’s not your usual Broadway show. The spareness of the plot forces the production to think outside the box and be a little more creative. I definitely recommend it!